When I first read the article I was a bit yeah whatever but after looking at the video and realy seeingbwhat he had done I have changed my mind somewhat . I think it’s a great adaption of an old radio – the reality is an opperating old valve radio is very limited – AM at least where I am in Australia is a thing of the past and becoming next to useless so by updateing the guts and developing a UI to work with the available controlles gives this radio a much brighter future (ok the win10) limits its life) but it has some promise. Really good looking, cool idea, also love the audio effect of changing channels. I don’t quite understand why it needs an x86 processor and windows 10 though. Very thoroughly overkill, unless it’s doing something else in addition? Still, it’s very nice. In my experience, it’s definitely doing something else. It’s downloading updates you don’t want and reenabling purposefully disabled processes in order to do what you don’t want. Despite what the “owner” may think, MS owns this radio now. There’s no legitimate reason to need so much power under the hood, much less do such a simple project under Windows. If you look, the video description says it takes a full minute for the radio to “warm up” with the Windows board. How quaint. A Raspberry Pi or Beagle Bone would have been more than sufficient and better suited. Heck even a STM32 would have been more than enough and offer a much longer battery life. One of the saddest HaD episodes I have seen. No offense to the author, but I am of the full-blown restoration persuasion. I feel that these old radios after having lived through everything from their spark-gap beginnings through the advent of broadcast radio, through two world wars to interplanetary space travel, have earned the right to live again proudly restored and in their former glory. This particular model is extremely rare and quite valuable in fully restored condition. Save your changes for a home-built low-power AM transmitter which you can modify to your heart’s content and use to send your preferred music signals to the old rigs who will be more than happy to play them back for you unmolested. Dear expat, I fully understand the feeling you have for these old devices. I’m pretty sure that without this “hack” nobody would had ever known that this one was still “alive”. As this one could also been thrown away or left in a shed somewhere rotting away. But this hack gives the device a second life… lot’s of attention and I’m sure that there are people out thee who realize that they have a similar one or know somebody who has it. This hacks brings the focus to these old devices and might eventually save many all thanks to the sacrifice of one. So don’t be sad, see the potential of the attention it will get as it might spark a whole new generation of radio enthusiasts. People who DO want to restore these devices to their original state. There is also a silver lining… in ten years the PC will be useless and the radio is ready for it’s deserved restoration. As in zombies having a second life! As a new body wearing the skin of a old body that got flayed. I used to restore old radios, including replacing bad components with modern ones and even rewiring when cracked rubber insulation was falling off wires, then tuning up, and finally restoring the cabinets and replacing grill cloth. All that effort resulted in new looking old radios that worked great. But no one wants to buy something like that. A restored old radio isn’t worth a dime more than an unrestored radio, as you will see if you ever attend one of the antique radio auctions that happen around the country every year. There are very few “rare and valuable” old radios. If you restore old radios you do it because you want to and like the result. You’ll never make any money doing it, and even if you manage to sell a restored radio, you’ll never even approach minimum wage for your work at restoring it. My neighbor can attest to that, I think at one time he had 37 old cabinet radios. No one except rare “old radio collectors” were interested in them, and they weren’t interested in buying any. If making a profit is ones motivation then just having the radio is already a loss. Sure, there is some market for internet radio media but most people buying such things are already ‘married’ to their Apple TV, Samsung smart TV, Chromecast or other mainstream commercial device. They don’t need or want a separate ‘internet radio’ because the best sound system in their house is already connected to their television. Nor do they want to learn how to use anything else. Even if your one-off homebrew player is demonstrably better where is the market for it? Gutting an old radio and inserting some modern digital guts is no more likely to make you a profit than is restoring the radio. If that’s what you are in it for your best bet is to drop it off at a local thrift shop, list it free on Craigslist or otherwise give it away to someone with a different set of motivations. Get it out of your house and take back your space before you waste any time trying to work on it. There are collectors that pay for old things like radios. But there isn’t enough of them to keep some many restorers well fed. It may be my observer bias, but I know more people who restore old radios than people who only buy working sets. Maybe in 50 years when the old timers who currently fix most of the radios are gone, we’ll see the supply go down. And demand could go up if having a bit of history as a functional decoration in a home becomes fashionable. Those Apple TVs and Chomecasts and Rokus are going in the trash in 10 years. And decades later perhaps people will hack them to get those devices to work even though their service providers are defunct. But I don’t think the design of an Apple TV will have quite the interest to future generations that an art deco styling of an early radio has. I wasn’t saying there was some sort of future in restoring the digital devices of today as antiques. @mrehost said that there was no profit in doing a proper restore of an antique radio. Given the context that seemed to me to imply that this meant gutting and filling with a modern digital something or other was the way to go. I was only responding that if profit is your goal you really shouldn’t be messing with these radios at all because you certainly aren’t going to make any profit turning one into an internet streamer either! 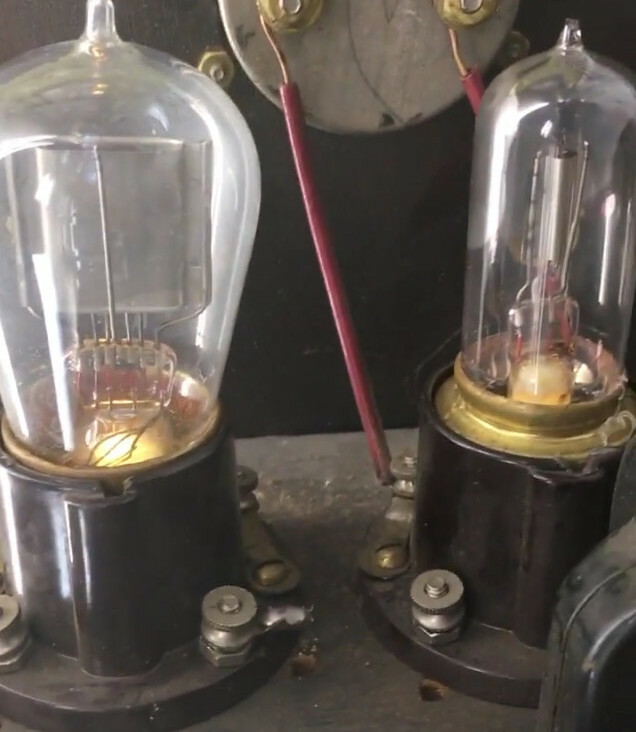 Either way you go, use it as an enclosure for a modern device or restore it to it’s original form… antique radios make sense only as hobbyist items. All discussion of making money is completely off topic. This would have been better by restoring the radio to its original state, and then, if you wanted the new functionality, put your windows/raspberry pi in a box next to it or somewhere in the same room, and use that to transmit to the AM frequencies that this radio will then tune into and amplify. That way, you can still play your podcasts or what not, but at the same time keep the radio fully intact. Depending on your region, it may not be quite legal to do this (the AM transmitter part) but it could probably be very low power or at a frequency that’s not used. i used to be very much on the restore, don’t gut it side of things. Then, while looking at a big antique console radio at a garage sale I realized something. I didn’t want it. Sure, I liked looking at it but I don’t have room to keep collecting more large AM radios in MY house! So.. if all these things need be preserved then who should keep them all? Maybe it’s ok if some of these don’t survive. But… Is he even sure this thing is from the 1920s and not even older than that? Look at those knobs, that looks like a regen, not even a superhet to me. Look at the case, very boxy and utilitarian. It has more the looks of the early-adopter radios from when it was only the particularly well off “proto-tech-geeks” that possessed such things. It is not like the ornate tabletop cathedral radios or the furniture-esque consoles that represent the majority of pre WWII radios still in existence. Finally.. look at those tubes. I have a radio from the 20s. It uses octal sockets. These things still have bases with screw terminals for the leads!! That’s a rare example of early tech there! Did he throw those away?!?! Yah, I think this guy screwed up and murdered what should have been a museum piece. This is not cool! And then to add insult to injury… Windows? Really?!?!? It looks similar to a 1926 Atwater-Kent I once discovered in the attic of building on a historic site. But since it was an anachronism to the site, it was transferred to headquarters and I don’t know what happened to it from there. Makes me wonder if making an effigy of your worst enemies and installing windows10 in that effigy might give some relieve from bottled up anger. You’d have to do it in secret though to not draw ire from any human rights watch. Especially those financed by the Bill and whatsherface Gates Foundation. Use Windows Vista if you’re especially evil. Hey, I’ve heard that the Mona Lisa is pretty old too, so just go ahead and paint your new masterpiece over it while you’re at it…. Or even better yet, your latest webcomic. No, no. He put Windows in that radio. But now, it needs a horn type speaker 3D printed for it. The newer speaker sitting next to it is just gauche. There will always be the “restore it! Its a classic!” crowd, funny they never seem to want to pay up to take whatever it is off your hands to “save” it. At the end of the day you own it, do what you want with it. Plus it doesn’t look like he did anything that couldn’t be undone, it might require finding some antique parts, but do-able if someone was sufficiently motivated. That being said I love the static effect, but the led tubes dont fit the style and I hope he doesn’t add the led strip across the lid, that would really look out of place IMO.